I heard a great story on NPR last week about a program that encourages creativity among people with Alzheimer’s disease as a medium for meaningful, enjoyable communication with others. In the TimeSlips program, a facilitator shows folks a photo and encourages them to make up a story about the characters in the picture. Without the pressure of remembering who people are or what is supposed to be happening (as might happen when you’re looking at a family scrapbook), someone with memory loss can have a fun time making up a story about someone else’s life. Plus, as one researcher pointed out in the NPR piece, you don’t have to be a trained therapist to try out storytelling with your loved one. In fact, you can try it out for yourself on the TimeSlips website. 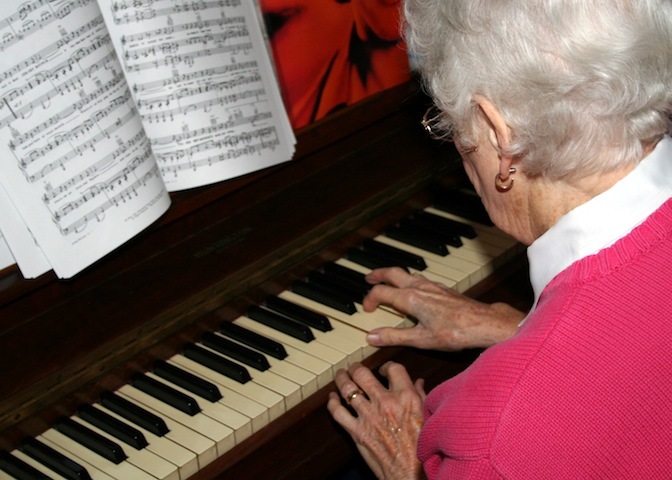 Creative activities – music, storytelling, dance, art – are universal human experiences that can be meaningful, even for a person with memory loss. Caregivers can engage in creative activities with their loved ones as a means of connecting with them. 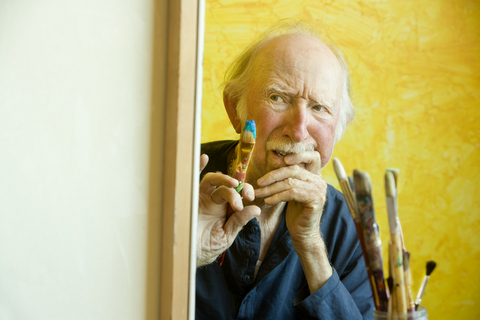 Creative activities take the pressure off of both the caregiver and the person with memory loss. The person with memory loss may really want to remember the details of their personal history or their current circumstances, just as much as the caregiver wants them to remember, and knowing that they can’t remember can cause anxiety. At the same time, the caregiver is often distressed by their loved one’s declining ability to remember things. Each person’s anxiety can feed into the other person’s anxiety, and then time spent together is all about worry and fear instead of simple, fun, meaningful experiences. When you’re making up something new, though, you don’t have to remember the details. The pressure is off both people. You don’t have to worry about creating a “stupid story” or “improvising wrong,” because the whole point is making up something new, in the present moment – something that only needs to last for the present moment, not for an eternity of literary critics and art historians. You simply get to enjoy the act of creation. So, I had the fun of creating a list of creative experiences to try with your loved one. Most of them involve music, because that’s my area of expertise, but feel free to pull in your own areas of creative interest. Also, don’t forget – there is no wrong way to play! Bearing all safety concerns in mind (i.e. don’t forget to turn off the oven for #7), you cannot do these things wrong. Try out the TimeSlips program. Seriously. It’s great. Get out some watercolors and paint what you hear while listening to some less-familiar music. I’d probably choose something classical, like this Bach Concerto. Improvise on the mini-marimba. You can see what that is like here. Cut scraps of fabric into different shapes, then make a collage or a picture out of them. You can glue the scraps to a sturdy backing material, or if you’re super-crafty, turn them into a quilt. Make up a new dance. Put on some music, and let the music guide your movements. Need some help coming up with moves? The MUVE DVDs are great for inspiring movement to music. Bake some sugar cookies and go all out with the decorating. Then, give them away to your neighbors (at least some of them!). Have you tried any of these experiences? What other creative experiences do you enjoy with your loved ones? Please share your ideas below! P.S. May is Older Americans Month in the United States, and this year’s theme is “Never Too Old to Play.” These ideas all prove that to be true. How ’bout that? Another great post with easy to use ideas. Love all your playful recommendations! Another great creative post . This is a lovely reminder that we can all enjoy (and benefit from) play. So often, caregivers get buried in the mountain of tasks and details involved in caring for their loved ones. I think that the permission you give to take a break from that and just enjoy one another is fantastic. Thanks, Ann! I love the notion that finding a way to be creative together can be healing for both people – it’s a win-win situation as far as I’m concerned. I love your point that being creative takes the pressure to remember off the person with memory loss and the family member. So obvious, but not intuitive. Thanks for your practical suggestions. Yes – obvious, but not intuitive. We can all do this, with the reminder that it’s okay! Yes! I consider it part of my personal mission to remind folks that playful music experiences don’t have to stop when your age gets into the double digits. Thanks for your comment! Yes, focusing on the relationship instead of the performance. Perfect! Thanks, Barb.